Earlier this week were invited to go and try out the new VR experience at Legoland Manchester and boy were the kids excited. The tiddler was excited for the general day out as he hasn’t been to the Manchester Legoland discovery center since his 4th birthday when he was told he was too young for one of the rides, so he really wanted to go back so he could ‘finally’ go on it and the big’un loves anything technology related at the moment so the virtual reality experience really excited him. 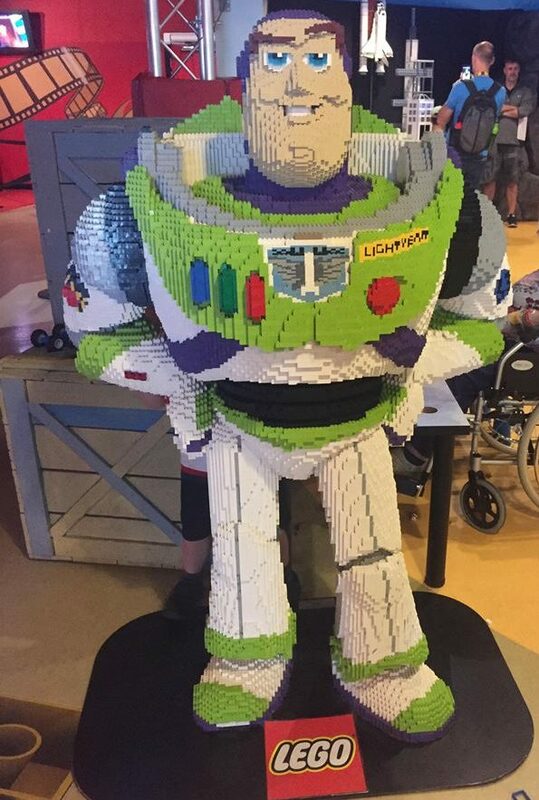 Legoland Manchester or Legoland Discovery Center as it is officially known is based at the Trafford center in Manchester. It is easy to find and has a free car park right next to it and as it is just outside the shopping areana you can choose to visit the Trafford center for some retail therapy, a spot of lunch or even a cinema trip too if you like or you can avoid it altogether. We arrived at 1pm and were given our tickets and told we could stay till 5pm, we were also told that we could come and go during that time if we wanted to. I always think is a great idea with attractions as if you want to break the day up you can, it also gives you the option of going somewhere else for food instead of eating on site if you. 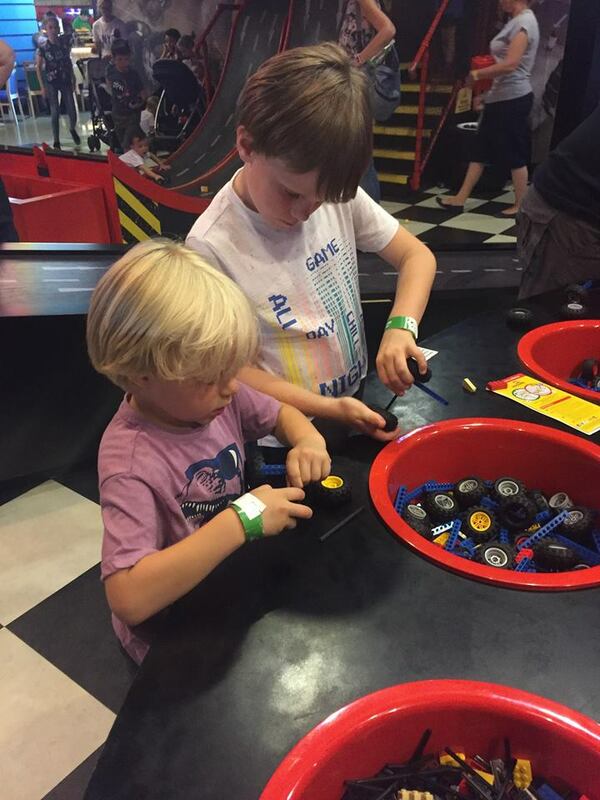 Before you enter the main room of Legoland Manchester you have to go through the brick factory. I loved this bit as it really adds a bit of magic to the day and gets the kids excited. After you have helped fix the machines each child is gifted their own block of Lego and I think this a really lovely touch and is something tangible that the children get to keep as a reminder of their day. When the doors of the factory open into the main area you are greeted with a ride where you can shoot the badies and save the princess. From here you walk through a model village made from Lego which is ridiculously impressive, my favourite bit was the Blackpool sea front as it took me right back to my childhood days, from there it opens up into the main room. and a creation station room. There is also a seating area and a cafe should you want to use it. You can use all of the above as many times as you like but I would recommend that you queue for the 4D cinema early on if you want to see it as it does get busy. Another top tip s that if you want to get a little bit wet you need to sit near the front, of course if you don’t want to then head for the back. After we had done everything in this area at least once we headed towards the bat cave but just before you enter you get to the new VR experience. The VR experience at Legoland Manchester is an additional £5 per person and we were very kindly gifted our tickets for this so that we could review it. You can go on in pairs or by yourself and unlike the big encapsulated VR machines I had seen before and was expecting these are open seats which means you can be watched by the other visitors, which is a little embarrassing however it does also mean that you can let your child go on and not have to pay to go on with them to supervise as you can just stand next to them which I think is a great idea. The VR experience is a Lego based car race and I know the name is virtual reality but it really is very realistic and due to the movements of the chair you do feel as if you are racing along with things flying at you, bends coming out of nowhere and obstacles that need avoiding. I personally squealed and jumped a few times and couldn’t help but laugh at myself, especially when I removed the goggles and realised I did in fact have a small audience. 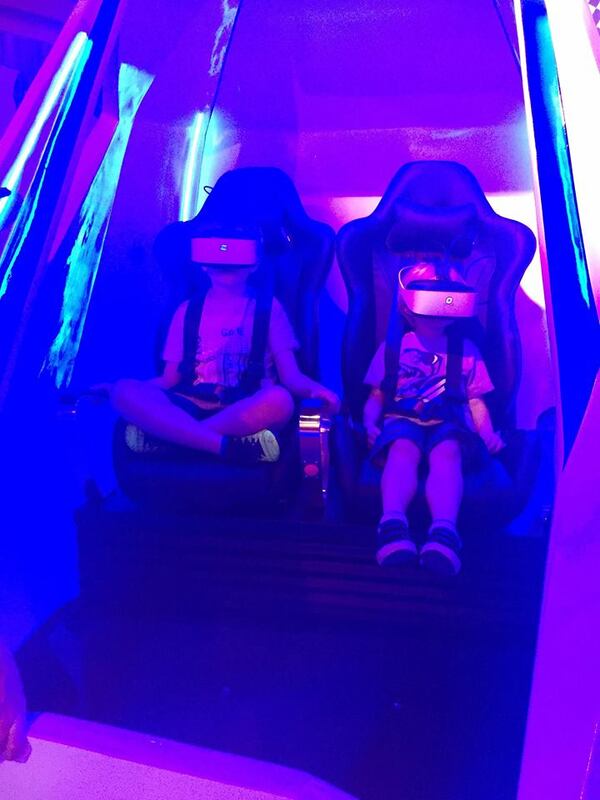 All three of us loved the VR experience and I would say it is suitable for anyone over 4 including the adults, however it is an additional £5 per person on top of entry and it does only last a few minutes so it could add up if you have a large family. Unfortunately they have done what a lot of big attractions do and they have placed it in an area that you have to go through in order to exit the building, so my advice is to be prepared so that you are not caught of guard, either decide you want to do it and if you do you wont be disappointed or know that you don’t and usher the children through towards the bat cave quickly. The reason I am saying this is because I did see some parents getting caught out as up till that point all the rides and attractions are included in your price so children were seeing there was no queue and desperately trying to get in the seats only for the parents to be told they need to pay and it being quite awkward for them to tell their children they cant go on or feeling they had to pay the extra. I think if you are taking older children from the age of 7 or 8 then this is something that they will particularly love so if you can it would be worth factoring it in for them as some of the other rides may be a bit young for them where as this will be perfect. From here we went through the bat cave where the boys tried their hand at being ninjas and crawling through a space avoiding the lasers which was fun but I think it’s fair to say they wont be breaking into Buckingham Palace anytime soon, especially the tiddler! Then through the gift shop (my pet hate) and out the building in search of some food and drink and a chill out which consisted of them talking non stop about the day especially the VR, which always makes me think it was a day well spent when they are still talking about it afterwards. (We were gifted our tickets in exchange for an honest review, all opinions are my own). Have you tried the new flavoured gins at Aldi? Looks like a fab day and I definately want to try that VR experience. Great review. I don’t mind the add-ons either as long as I’m prepared for them. I do like the fact you can watch and don’t have to go on it if your kids are on it tho. That’s something. Love lego land tho! We don’t get to go much I have a 7 year old who would love this!!! !